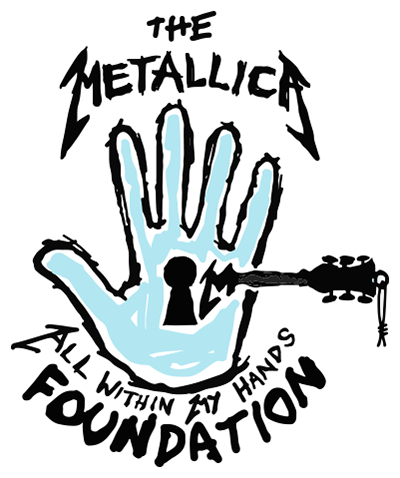 In February 2017, Metallica formalized and bumped up their decades of charity endeavors by announcing the formation of All Within My Hands, their committed initiative to help right some of the hardships from which too many suffer by addressing such areas as the fight against hunger, supporting workforce education and other critical services. Tonight was a celebration of AWMH’s first full year, and as it should be, the celebration itself dovetailed with the primary need, which was delivering some powerful funds to the charity. As such, it was a unique night (and a way to be) with Metallica. A low(ish! )-key, lo-fi acoustic Metallica, in a lounge setting – some sofas, some tables, some snacks, some beverages – with a seated balcony, all in the hallowed, historic, and intimate Masonic Auditorium on Nob Hill. Before an acoustic note was strummed, and having commenced online the Monday before, a silent auction took place, featuring a myriad of opportunities and articles from dinner with Lars to custom-made Rob Trujillo Beneduci boots to a personal stage shout out from James at a future gig. Many of the experiences, along with a few of the actual instruments James, Kirk, and Robert played during the show, remain available to bid on through Friday. Cage The Elephant warmed up the happy Saturday night audience with a vibrant set, but make no mistake, it was our acoustic horsemen who everyone was here to see and experience. The Bridge School Benefits, as well as a MAP Fund performance back in May of 2014, have certainly cleared the ground for them to have fun with the medium. It offers the fans – and the band – a chance to enjoy the songs with altered arrangements and haunting twists… because when Metallica go acoustic, they take the misty midnight mystery path as opposed to sun, sand, and surf. After some early band discontent (they were not enjoying their monitor mix even though we were very much enjoying the reshuffled “Disposable Heroes” and Deep Purple’s “When A Blindman Cries” without noticing a damn thing!) their in-ear satisfaction arrived around “Turn The Page,” and you could see them really starting to have some fun. By the way, there’s a song that was made for this medium, right?! In fairness, I think performing your material like this must be high-wire act stuff, to be honest. You play these classics through megaton PAs and suddenly you’re there, without the level of PA required to reach far corners of an arena you’re accustomed to or production to hide behind, reinterpreting songs which aren’t natural acoustic leaders. But normal rules don’t apply to this band. James has a voice, a manner, a way, and a lyrical loneliness which explodes in these moments. Make no mistake, he carries a bit of Cave, a dash of Waits and, for me personally, an aura of Johnny Cash, and it just blossoms at these moments to reveal a whole other intriguingly beautiful plant. The relaxed jazz-like shuffle and flow of Lars (all those years in a literal house of blues giving him the innate knowledge and know-how necessary to master such moments), while Kirk’s precision and feel along with Rob’s selfless ability to stretch, cover, and provide the warmth without overpowering in any sense all combined to allow the audience to enjoy the journeys taken. This gig also saw Metallica expanded to an eight-piece! Old friend of the band, an HQ legend and supremely talented guitarist and mandolin player, Avi Vinocur from the band Goodnight, Texas was invited to add his craft. David Phillips on peddle-steel, Henry Salvia on keyboards, and Cody Rhodes on percussion (Avi, David, and Henry had all played with James when he did the Sammy Hagar “Acoustic-4-A-Cure” benefit in 2016) also lent their talents rounded out the group. The numbers aren’t in as to what the evening generated, and given the fact that select items in the online auction will be available to bid on until Friday, November 9th at 5 PM PT, it will be a little while before that statistic can be unveiled. One thing is certain: tonight raised a lot of money for a lot of people who need the help that AWMH brings. Was tonight a resounding success? As I said at the outset, in so many ways it was before a note was delivered. But yeah, include those notes and add some uniquely beautiful and twisted interpretations of classic Metallica moments and I think you can safely say that it was a huge, huge success.